Today I looked up the definition of the word ‘marginalised’ – it’s this: to treat a person, group or concept as insignificant or peripheral. Never have I experienced being marginalised in such a direct and literal way than when I ride my bike on the road. 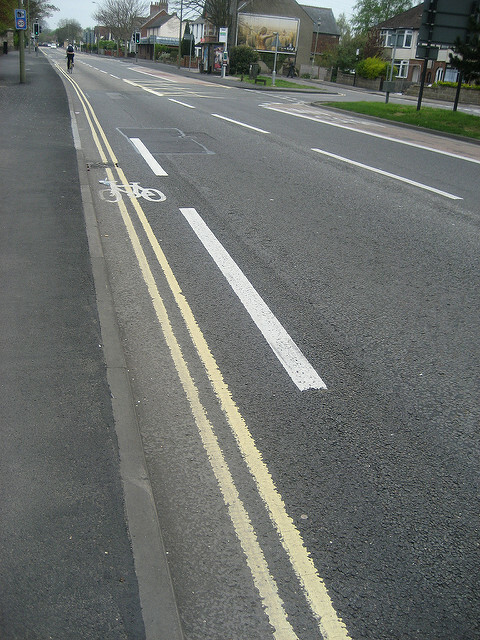 It’s not the act of cycling or doing that on a road which creates the tension. 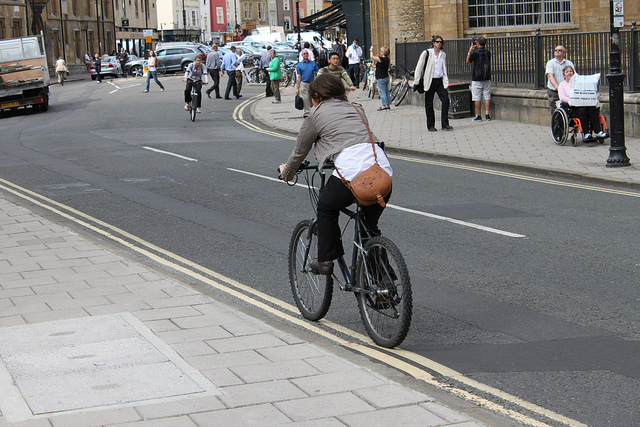 It’s the interaction between myself as a ‘cyclist’ and other more powerful road users – people driving. 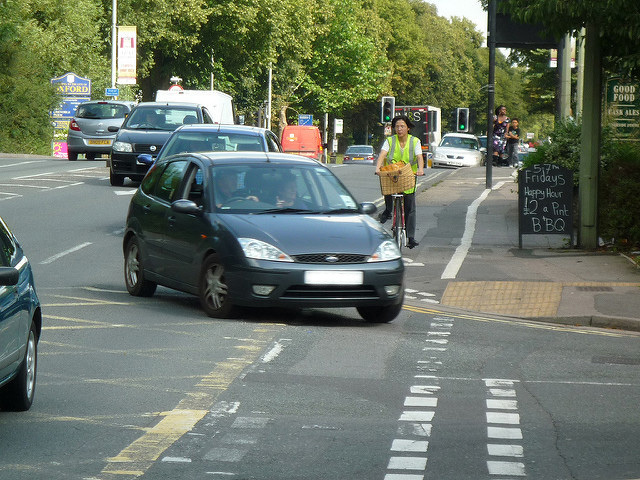 People cycling are physically pushed to the side of the road, the margins – a danger zone of pot holes, vehicle blind spots and parked cars with doors liable to swing open unexpectedly. Daily we experience the harassment, abuse and harm which is common to all people and groups who are not considered to have an equal right to be in a given space. This treatment leads us to think that we should not take up space on the road. If you have ever asserted your legal right to ride in primary position (that’s the centre of the lane) on a busy road you’ll know what I’m talking about. Most likely, it will begin with drivers beeping their horns. Then, frustration at being slowed down by a cyclist may get the better of them and they might perform a dangerous overtake narrowly missing you and/or oncoming traffic. You will be left pedalling along, heart pounding, a journey still to complete, still surrounded by drivers, trying to hold your nerve and tell yourself that you are not doing anything wrong, that you are trying to be safe. When I think about the insults that have been slung at me through car windows, the deliberate close passes or threats of violence I have received since I began cycle commuting, it is like nothing I experience in any other aspect of my life. The road is the very definition of an unsafe space, and people on bikes are marginalised in that space. The funny thing about cycling is that it is not a person, group or concept – it’s an activity. An activity which anyone who acquires the skills of balancing and access to a bike can participate in. Our society marginalises many groups of people because of who they are, what they do, or don’t do, what they have or don’t have or their heritage. Unless you are the victim of this treatment it can be hard to understand the destructive impact of it. But with cycling you don’t have to be black, a woman, an immigrant, queer or any other identity which can confer prejudices in our society in order to experience the fear and frustration of being labelled ‘cyclist’ and thus treated as less significant, peripheral, an annoyance. It is something that people who are otherwise privileged can do (for instance, white, educated people) and have the same humbling experience of being marginalised. Until very recently, I figured that having the experience of how scary it can be to be labelled, de-humanised and put in harms way gave me and other cyclists valuable insight. I thought that if more people felt the injustice of this type of treatment we might become more empathetic as a society. For me anyway, it was a daily reminder that while I can get off my bike and be treated with respect, some people cannot so easily shed the thing that labels them as ‘less-than’, as insignificant, as marginal. I was aware of how scary the intimidation was that I experienced and witnessed on the roads (as all people who cycle are) but it didn’t torment me the way as it does now. The change was experiencing the real consequences of being unsafe on the roads when my friend Claudia was killed while riding her bike in Oxford. Claudia was a vibrant and active 31 year old who studied climate change, cared about the future, had plans, cycled confidently and had so many people who loved her. In the cold light of this loss, it sounds like a ridiculous and brutal social experiment to think a fairer society could come from everyone being equally oppressed. Now I want to change the perception that people on bikes have less right to be on the road, to take up space and sometimes to slow down traffic. This requires a massive shift in perception about who and what the roads are for. The way I see it, we have two ways of changing the roads – cultural shift and structural change. People on bikes are not designed into our road system – bike lanes are non-existent, full of parked cars, end abruptly, cyclists are lumped in with buses or cars or pedestrians even though our needs are quite different. In that context a driver could be forgiven for thinking that people on bikes are peripheral, insignificant, a nuisance, that their place is on the margins. Structural change means designing cycling ‘into’ the road system, not as an after-thought, not only where there is enough extra money but everywhere. I sit on the fence when it comes to segregated cycle lanes, I see the value because the challenge of interacting with ‘the other’ is removed and everyone can relax. Some places are too dangerous to have bikes on the road and I’d much rather have a segregated lane than get off and walk. And yet there is something uncomfortable to me about the idea that this is the wholesale solution because I think the presence of people on bikes among people driving can change our roads and make them safer and more human for us all. The cultural shift requires a universal acceptance of the right of people to ride bikes on the road, an acceptance that these people are part of the traffic. This principal is already accepted in law. We don’t need to campaign for the civil rights of people cycling on the road, we already have those rights. Our government-approved national cycle training programme teaches this. It teaches visibility, taking space, communicating and taking responsibility as an equal road user. They teach this because when people on bikes ride too close to the curb to make space for driver’s vehicles the risks of injury and death that they face increase. Therefore to take the middle of the lane can be the safest place to be. Our problem is that there is law, there is what we teach as safe cycling practice and then there is the culture of the road. The culture which teaches the person on a bike that they must move aside for bigger more powerful vehicles or risk harassment. This culture is lethal. I’ve done cycle training, I know about primary and secondary position, about looking and signalling and I am a seasoned cycle commuter, but sometimes I simply don’t have the energy to cycle safely. On these conflict-weary days, when the road is fast, overtaking is dangerous and the hard shoulder littered with potholes I cycle too close to the edge – I do as I am expected in order to avoid getting a reaction from drivers. Now imagine this: we begin to shift the whole psyche of the road, we slow down, we teach drivers as well as cyclists about what safe cycling looks like and ask them all to observe and respect it. We tackle the victim-blaming which allows the conversation about cycle safety to be reduced to a debate on helmets, lights and other protective or visibility equipment. We change our driving lessons and tests to help drivers learn what to expect from cyclists. We engage all road users in a new understanding that the road is not for the fastest, strongest and biggest but for us all to share. In so doing, we make the roads safer, more pleasant places to be for people cycling, people driving and people walking. Most likely we get more people riding because they feel respected and safe. We begin a virtuous cycle, as the more people cycling, the safer it becomes. This is my vision – for a shift in our collective consciousness where people on bikes move out of the margins. This is an opinion piece by Eleanor Smith, it does not necessarily reflect the view of the Broken Spoke.